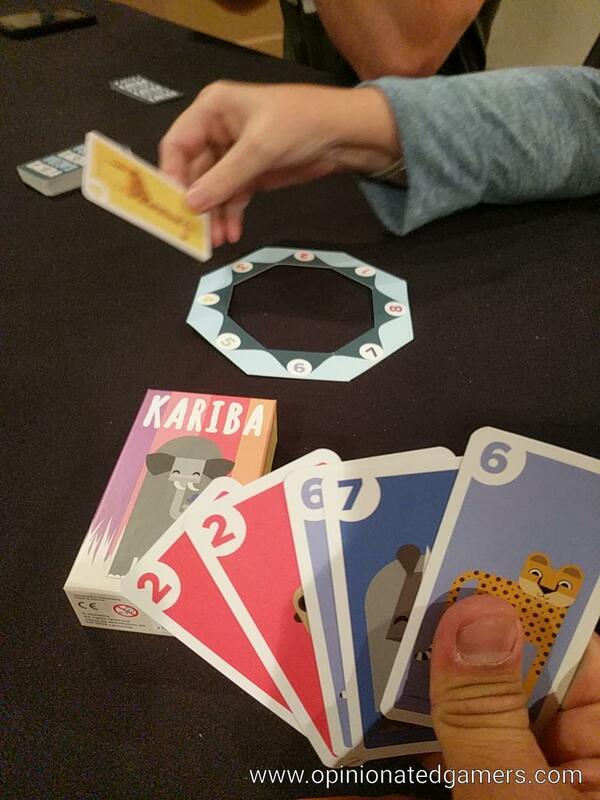 In Kariba, play focuses around an African Waterhole. The animals in this particular safari are very orderly, and each type of animal only drinks water at their assigned place around the octagonal waterhole. The animals in this part of the world are numbered 1 to 8. 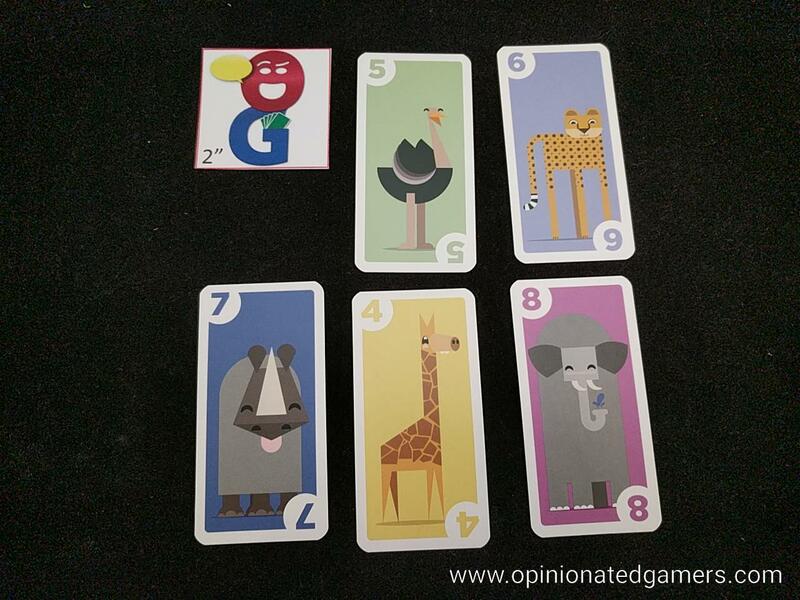 There are 8 of each type of animal in the deck – this is shuffled and each player is dealt a hand of 5 cards. The rest of the deck is placed on the table as a draw pile. 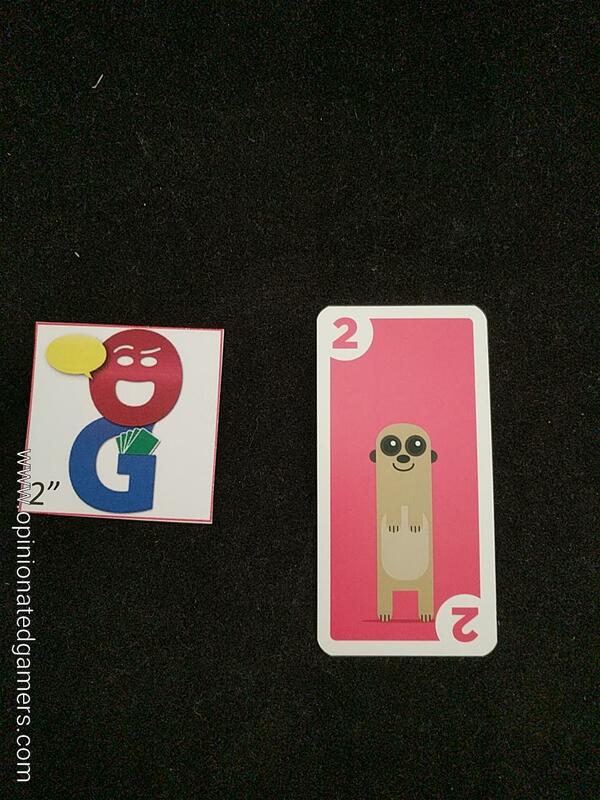 On a turn, a player can play one or more card of the same rank, and these cards are placed in the appropriate place around the watering hole. If there are multiple cards in this space, tile them so that you can see how many cards of that rank are at the watering hole. Now check if there are 3 or more cards of the type which you just played. If so, that pack of animals will chase away the next lower numbered stack at the watering hole – so long as there is one available… The active player takes all the cards of that lower numbered stack and places them in their scoring stack. There is a special exception that the strongest animal, the elephant (#8), can be chased away by the weakest animal, the mouse (#1). But we already knew that would happen because of the fables we learned as children. After you have played your card(s) and possibly chased animals into your scoring stack, you draw cards from the deck to bring your hand back up to 5. The next player in turn order now starts their turn by playing cards of their choice. Each round of the game goes until the draw pile is completely empty AND when one player has played the final card from their hand. The game (or round) immediately ends at that point. All players discard any cards left in their hands, and your score for the game/round is simply the number of cards found in your scoring stack. The game could be a single round, though it could really be to any agreed upon number of rounds. The rules suggest playing three rounds in a complete game. 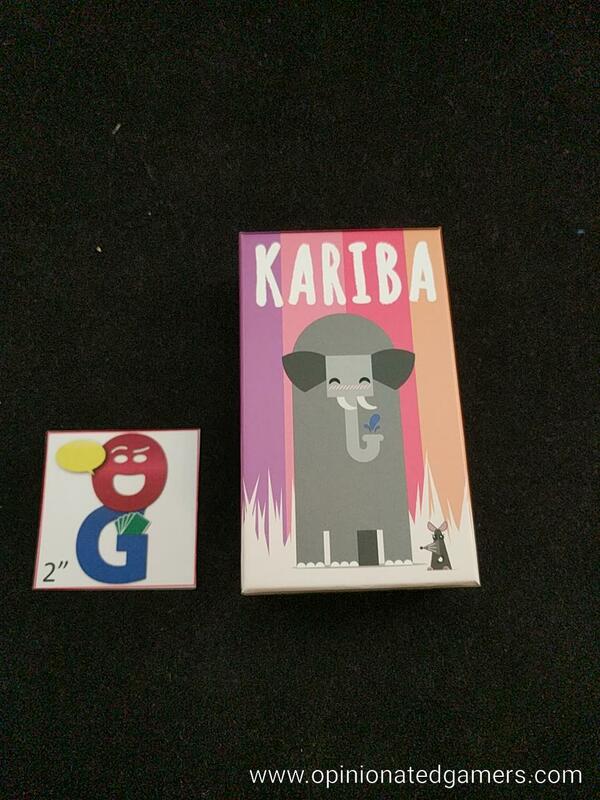 Kariba is one of those games that is so simple, it makes me wonder why I (or anyone else) hadn’t thought of it sooner. The rules are dead easy to teach and learn, and it’s a game which really can be played by almost any age. The art on the cards is the strongest selling point for me. The stylistic blocky animal art is adorable, and I find it very reminiscent of Charley Harper (a renowned local nature artist from my hometown of Cincinnati). The strategy is simple, but not entirely straightforward. Surely, the best tactic is to lay in wait with a triplet of a high card, and wait to play them in one fell swoop to capture a large stack of lower numbered cards. Also, if you happen to have multiple cards, if you can get away with playing only one to make a triplet, you can then play the other card of matching rank on the next turn to hopefully capture more cards. At times when you cannot make a set, you must try to figure out where the safest place to play a card is… you don’t want to set up your opponents for a big score if you can do so.